Nearly everyone that cooks or eats knows the versatility, flavor, and health benefits that olive oil can bring to food preparation. But did you know that it has nearly countless uses around the house to preserve finishes, fix squeaks, and even enhance your beauty routine? No need to use your most expensive olive oil; opt instead for a bargain brand for household uses. To make it even more useful, keep some oil in a regular spray bottle or a reusable pressurized sprayer that can be found in kitchen supply stores. Since olive oil is usually stored in the kitchen, let's start there and look beyond the sauté pan. After hand-washing wooden kitchen pieces, give them a good coating of olive oil to nourish the wood and prevent cracking and discoloration. Let the oil sit on the wood for about five minutes and then buff with a soft cloth. When you're preparing a recipe, coat measuring cups and spoons with a bit of olive oil and they will release sticky foods like honey, peanut butter, and mustard easily. Put a dab of olive oil on a soft cloth and rub stainless steel appliances, pots, and sinks to prevent streaks, water spots, tarnish, and corrosion. Finish by buffing with a soft cloth. Olive oil won't stop silver from tarnishing but it will keep it shiny longer. Just a dab of oil on a soft cloth rubbed over polished silver will slow the oxidation that brings on tarnish. Saturate paper labels with a drop or more of olive oil and let it remain on the label for at least 15 minutes. The label will peel off easily and the plastic, glass, or wooden item can be hand-washed to remove any remaining residue. Time to buy another bottle to keep on hand in the bathroom for grooming and accessories care. Pearls can become dull from make-up and soil but many cleaners are too harsh to use on the delicate finish. Bring back the luster with a bit of olive oil on a soft cloth that is rubbed over each individual pearl. Buff dry with a soft cloth. Have a ring that just won't budge from your finger? Coat your finger in olive oil and use a soft cloth get a grip on the ring and slowly work it off your finger. Dip a cotton swab in some olive oil and rub it over the teeth of the zipper. Work slowly and gently ease the zipper pull up or down. Bring back the shine to patent leather, rubber, and natural leather shoes with a bit of olive oil on a soft cloth. Don't use on suede or any napped surface! Buff with a clean cloth. Razor blades are expensive. To help them last longer and prevent dulling rust, wipe down dry razor blades with a cotton ball or swab dipped in olive oil. Allow the blades to dry before using. Olive oil is an ideal natural lubricant for rough cuticles and dry skin. You can even add a bit to your warm bath to soften skin while you bathe. Comb a bit of olive oil through dry hair to tame fly-aways. You can also rub a bit on your hands to run through your hair to control frizz. Both your hair and hands will look better. 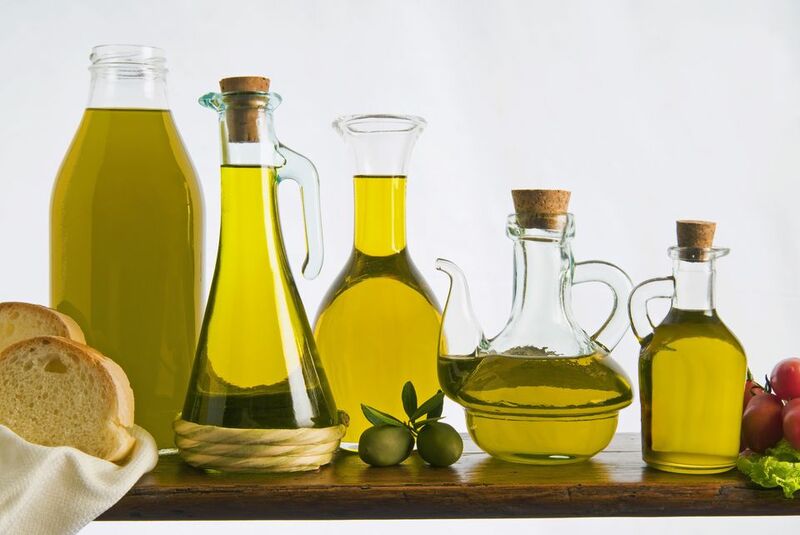 Dabs of olive oil will remove heavy makeup without any drying chemicals and leave your skin feeling soft. It is particularly good for removing mascara because it also moisturizes dry lashes. Olive oil will ease the pain of removing sticky substances like paint and gum from hair. Simply coat the area well and slowly work out the sticky mess with a tissue. For tough stains on skin, like hair dye, car grease, tar, permanent marker ink, and oil paint, mix a few drops of oil and one teaspoon of sugar to create a gentle but effective scrub. These tips will work in just about every room. A few drops or a quick spritz of olive oil will silence squeaky hinges on doors, cabinets, appliances, or car doors. Bring back the beautiful look of wood by using a bit of slightly warm olive oil to cover small scratches and water rings. Apply the oil with a soft cloth and then buff with a dry cloth. Make a good furniture polish to use weekly by mixing one-fourth cup olive oil, four tablespoons of distilled white vinegar, and two teaspoons lemon juice. Place it in a spray bottle and give it a good shake before each use. Store in the refrigerator. Leather furniture, gloves, and baseball mitts will become soft and supple after applying a few drops of olive oil over the surface. Don't forget to share the benefits of olive oil with your garden. Pour a little olive oil into rain barrels. It will float on the top and prevent mosquitoes from breeding. Olive oil will protect wooden tool handles from drying out and splitting. Coat metal tools to prevent rust and help dirt and snow from sticking and oil the moving parts of pliers and clippers. Don't forget to protect wooden outdoor furniture! Ferns and palms will be lush if you add two tablespoons of oil to the base of the plant about once per month.